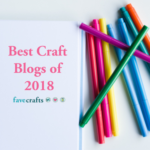 Recently, Red Heart Yarns sent me a gorgeous bag full of yarn to try out, and it’s been SO much fun dreaming up what to do with all the new yarns. The first one I got a chance to play with was Red Heart Boutique Swerve, in the Fizzy Colorway. 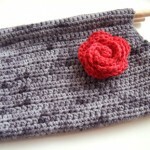 It’s being sold as a scarf yarn, but I saw something fun for summer – the Swerve Crochet Clutch! 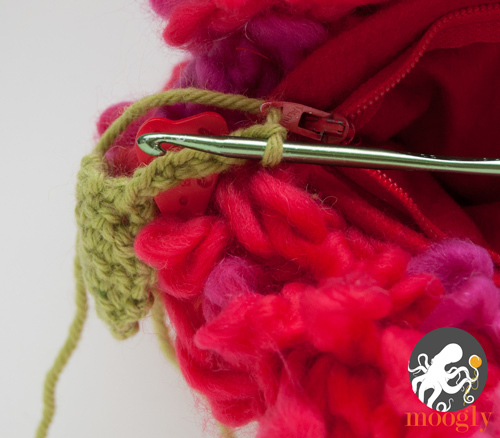 Start by opening up the skein and unwinding it completely, laying it out on the table or couch next to you. You may find that one end has become “undone” and straight. No problem, just start from the other, “loopy” end, and that straight bit will be used later! Red Heart’s label pattern for Swerve calls for working the yarn with your fingers instead of a hook, and it’s easy to see why. 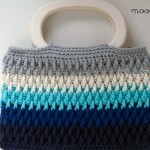 With a yarn like this, you can’t see the stitches! What you’ll need to do is to go by feel, to find each stitch. Where you’d normally go under both loops, with this yarn you’ll want to go under just one. 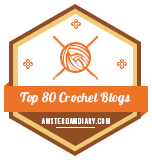 It doesn’t matter which one – again, you can’t see the actual stitches! Be sure to pull up each loop nice and big, never force the hook. Just go with your gut and it’ll be fabulous. 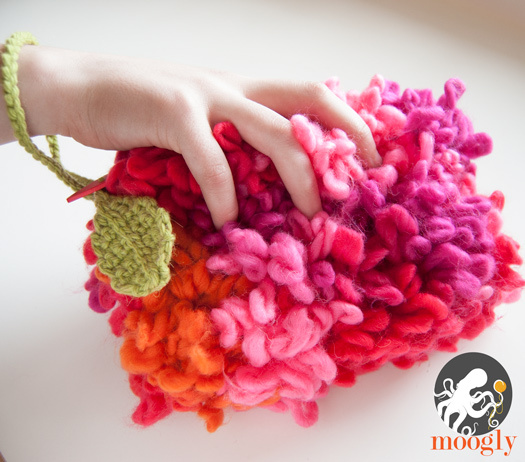 If you don’t have a Q hook, you could in fact make this clutch with your fingers! While it’s just single crochet stitches, the challenge of this yarn makes this an intermediate to advanced pattern. It’s worth it though, because the end result is so fun. And it works up SUPER fast! Stop when you don’t have enough loopy yarn to make another row, and finish off, leaving the long straight tail. If your tail end isn’t straight, gently loosen/pull out the metallic thread to straighten the roving portion. 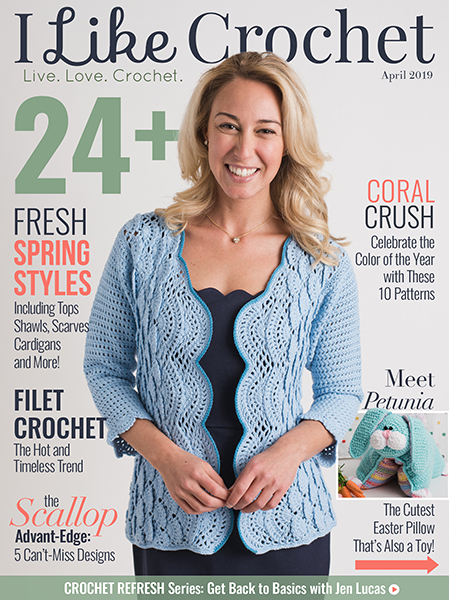 The finished crochet piece should measure about 10″ x 6″, though it’s not important to get these exact measurements. 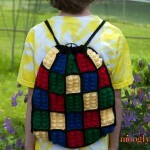 At this point, cut your fabric to be a bit larger than the crocheted piece, about 11″ x 7″. 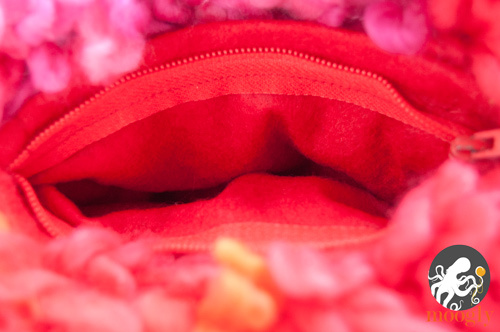 Sew a seam in each short end, and sew in the zipper, being sure to leave tall flaps on either side of the zipper, to protect the yarn from the teeth. Then sew up the ends and trim off excess. Fold the crocheted piece in half, so that it’s roughly square. 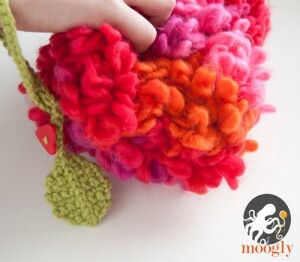 Using the long tail and the plastic yarn needle, whip stitch each side closed to form an open pouch. Again, feel for the stitches and pull gently. 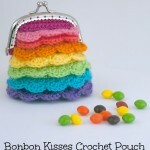 Insert the Lining and sew it into the crocheted pouch by hand. 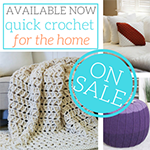 Don’t go all the way through the crocheted piece, but be sure to grab enough yarn in each stitch to make it secure. Thread the working end of the yarn through the hole in the zipper pull tab, and then (if desired) through the button holes. 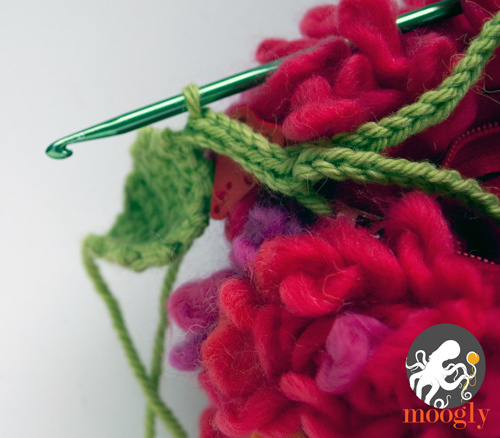 Push both forward, towards the skein, and start crocheting with the working end of the yarn. Next, ch 3. 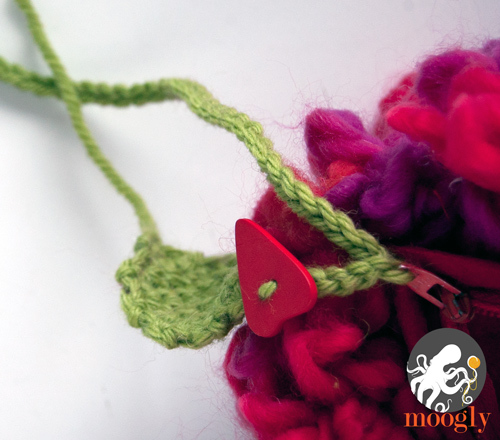 Slide the button back to the hook, and work a ch with the yarn on the other side of the button hole, as show below. Then ch 3, and slide the zipper pull tab back to the hook. Work a ch with the yarn on the other side of the zipper pull tab, enclosing the end of the tab in the ch st.
Then ch 50 (or to desired length) for handle loop. Sl st in the 3 ch sts between the pull tab and the button, sl st in the button enclosing ch, and sl st in the last 3 ch (7 sl sts). 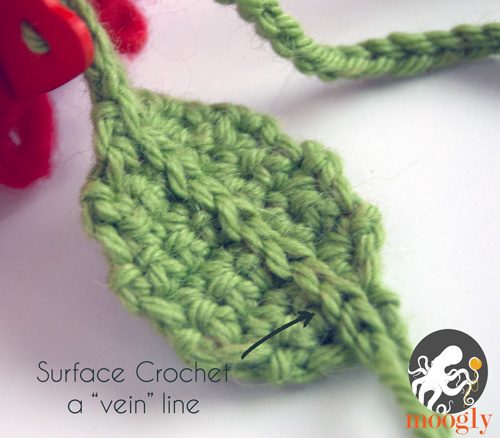 At the leaf, work a row of surface crochet sts along the leaf as shown, to create a vein. Break and weave in ends. 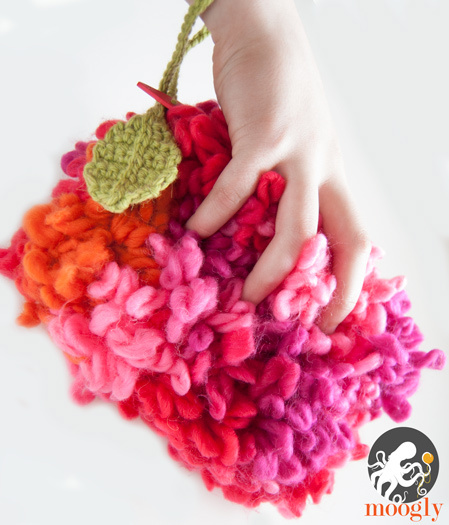 Crocheting the Swerve Crochet Clutch takes just a few minutes – and sewing and assembly not a whole lot longer! 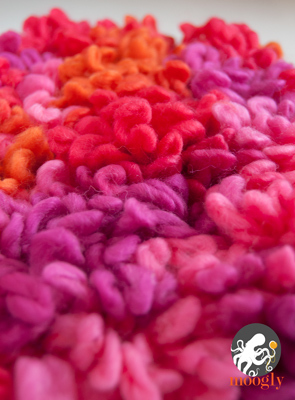 It’s a super fun yarn to work with, and I hope you get a chance to try it out soon! Many thanks to Red Heart Yarns for the skein of Boutique Swerve that inspired this pattern! I think this would be a delightful clutch for a young lady to care to the prom. So young and cheerful. I can’t wait to try one. I have 3 granddaughters who will be 16-17 this year, I can’t wait to see their faces. thank you. 😀 Great idea Marcia! 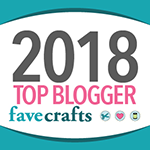 You’re very welcome – thanks for commenting! We’re did you get the free yarn? Where do I sign up? Can you post the website? Hi Rachel! Sign up for what? I’m sorry, I’m a little lost! 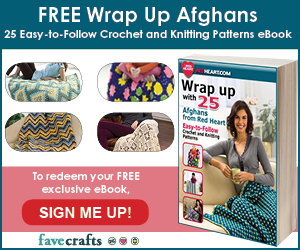 Sign up for the free yarn!